Paddy's Magnificent Roving Bikes and a Penny Farthing Experience for grown ups! See all kinds of weird and wonderful wheelies from the Double Eagle, a replica 1880s tricycle kitted out as a fire fighting unit, to the Uber, a two tier tandem where one person sits up high and the other down low. There’ll be chances to have a go and, for the first time, test yourself on a Penny Farthing. These bikes, with their giant 50 inch front wheel, were notorious for accidents even in their day but you’ll be in safe hands with someone each side to take a firm grip of your belt. Strictly adults only! Step up after you’ve started on the Little Penny, just over half the size and suitable for adults or children over 8. It’s all down on the netball courts, in the middle of our kids’ zone where they’ll find hours of free fun. 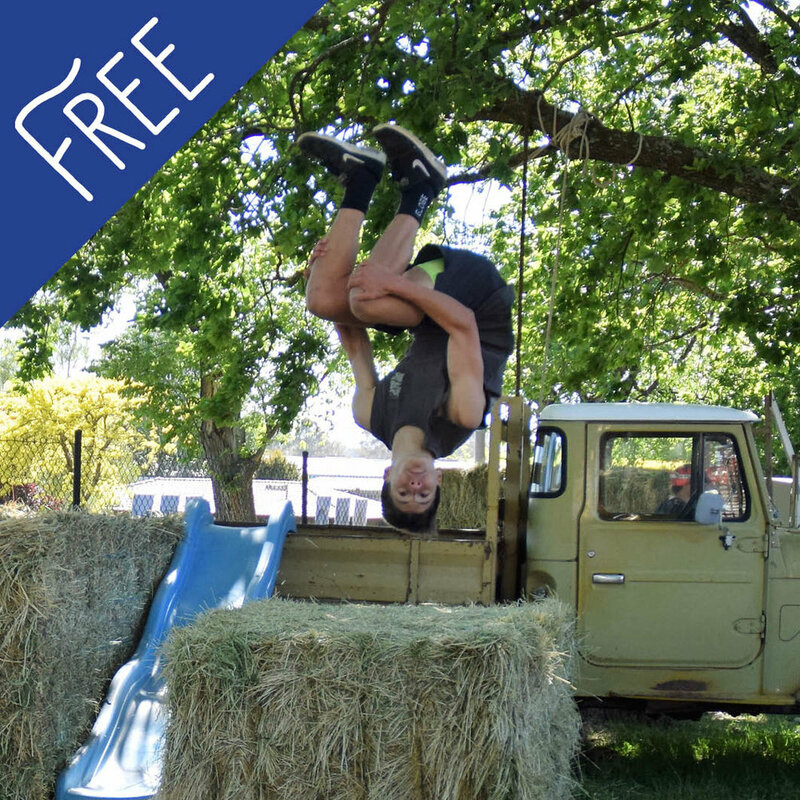 Our FREE farming-inspired parkour is an old-fashioned obstacle course with a contemporary twist that's a hit with kids of all ages. There's a separate course for younger challengers to clamber over safely while longer legs love leaping over our series of agricultural obstacles. Come and watch, or have a go. It all starts with laser tag in the hay bales at the Friday night carnival then becomes country parkour all day Saturday from 9am - 4pm. If you're wondering, parkour started as a French military training exercise navigating the most efficient path through an obstacle course. It's now practised all over the world, in forests and urban jungles, with all kinds of moves, from the tic-tac to the gap jump, and a philosophy that every obstacle can be overcome! Come to our magical Farm Shed! Spot the unicorns and the fairies, get up close and see a sheep being shorn by our clever shearer and guess - Who's Poo? There's lots for the little ones to learn, and do, with plenty of fun craft projects: make a mini-aquarium, a terrarium or a snow dome to take home, or a dinosaur or flower head band - all free! BYO animal and enter the charming children’s pet parade. Entry is free so bring your favourite non-human friend. We've had goats, a pair of blue tongue lizards and a giant cockroach as contenders along with cute cats, dressed up dogs and more! There are 4 categories: Pet sheep, goat or calf; Pet Dog; Any other pet animal; and Best Decorated Pet. First prize in each class wins $5 and every entrant is awarded a ribbon. Best in Show wins the Jack Willmott Memorial Ribbon in honour of our long-time judge, the late, great Jack, plus a pet portrait by artist Gavan Cowan. No entry form is required - just be at the Kids' Show Ring by 10.30am for judging. This may well be the best value show bag in the state! Buy the bag just inside the front gate and fill it with goodies as you follow the treasure hunt clues and discover every part of the show as you explore, collecting a free lunch on the way. Be quick - these sell out fast! There's free face painting plus easels and paint to make your own artwork and craft workshops, just for kids - all materials supplied. BYO imagination and enthusiasm and help us Build a Farm out of boxes of all shapes and sizes. You can make jewellery or relax in our reading corner and more - all free - in the kids' activity zone inside the big white marquee next to the netball courts. Kids of all ages, Mums and Dads, love getting to work with hammer and screwdriver in The Farm Workshop. Make your own tractor, a tool box or boot remover, branded with the Kyneton Show logo so you'll have it as a souvenir forever! Or create your own invention. Whatever you make you can take it home - for free! We're going wild, adding Australian native wildlife to our animal roll call! Get up close for a safe ‘hands on’ wildlife experience for children and adults, with interactive workshops on the importance of all living organisms and species across our vast country. 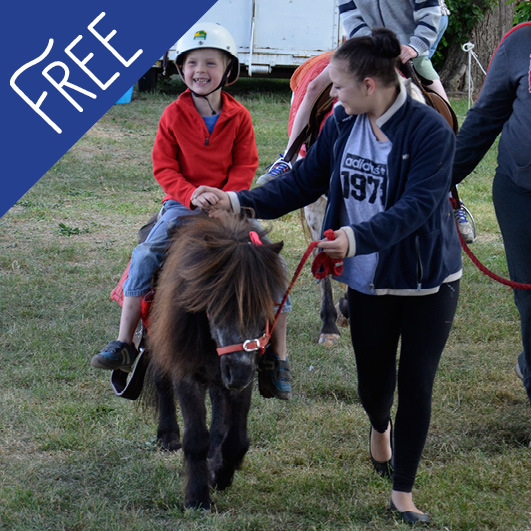 Enjoy free pony rides down beside the netball courts where you'll also find the bright red Lions Club Train which will be taking passengers all day - no ticket required! You might even see Captain Koala making a guest appearance with our friends from the Country Fire Authority. 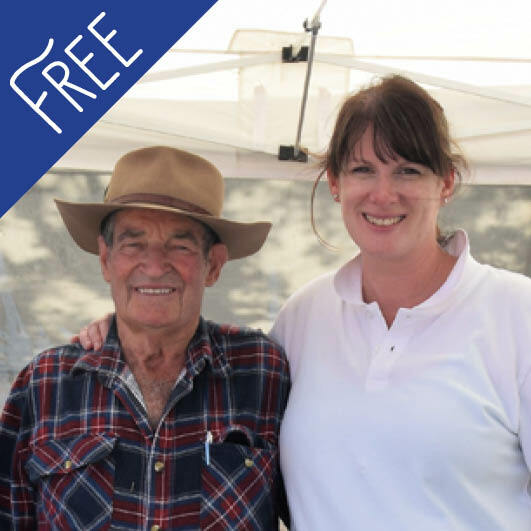 He may be the most famous farmer in the state, starring at the Royal Melbourne Show each year, but Farmer Darryl saves a special place for his home-town show where he opens up his marvellous menagerie for free. Get up close for a pat, a cuddle or a selfie with these super cute junior farm animals and don't miss story time with Darryl and Polly! 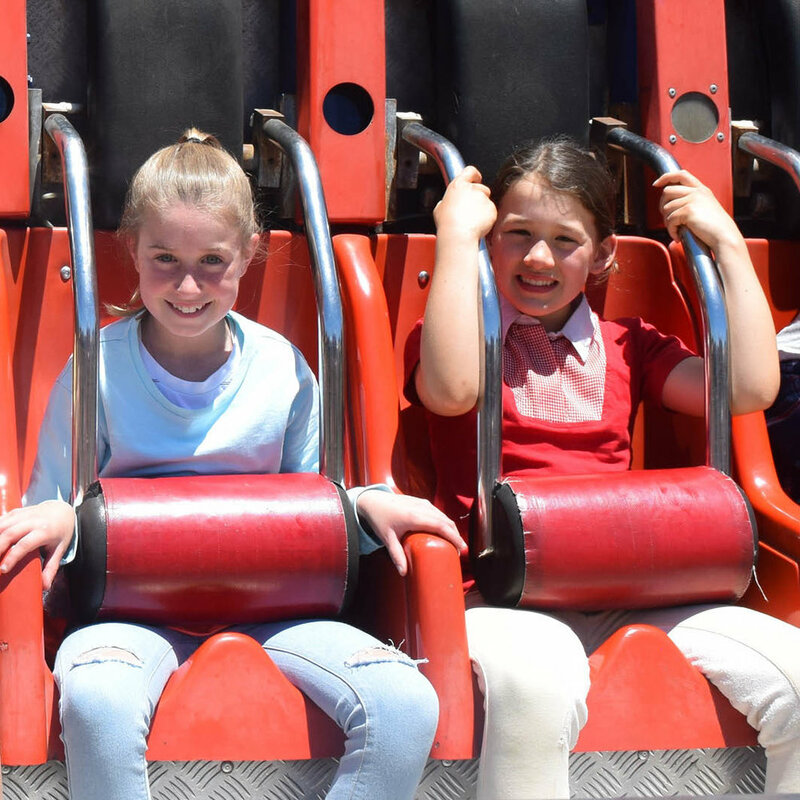 The Pavilion has been at the heart of the Kyneton Show since the very first competition in 1858 and it's never been bigger with more than 2,000 entries and growing! You'll see everything from the best country baking and champion rose to biggest vegetable; from knitting and needlework to Lego and best decorated pet rock; from jams and chutneys to clever craft, amazing art and stunning photography. This year the Pavilion will be open for the Friday night carnival for the first time, as well as all day Show Day. Tempted to try your luck? While Best in Show is an honour, the fun is just being part of a proud country tradition. See the Pavilion page for hundreds of categories to choose from. There really is a category for everyone!